The Russian Federation and the Sokhumi occupation regime signed the so-called "treaty on alliance and strategic partnership" in Sochi on the 24th of November 2014. This action from the Russian Federation contradicts international law and undermines such fundamental legal principles as the non-interference in the internal affairs of states, the non-use of force or the threat of force, sovereignty, the inviolability of borders, territorial integrity, and the good-faith fulfillment of international commitments. The signature of this document is directed against Georgia's sovereignty and territorial integrity, and constitutes a further step taken by Russia towards the annexation of Georgia's occupied region of Abkhazia. The text of the document envisages a qualitatively deeper level of integration with the Russian Federation and the incorporation of the Abkhazia region into Russian military, economic, social and legal space. The document provides for the creation of a "common security and defense space" and a combined group of armed forces. According to the text, Moscow undertakes a legal commitment to provide the occupation regime in Sokhumi with advanced military equipment. The document also envisages the de-facto abolishment of the Georgian-Russian border along its Abkhaz section and the reinforcement of the occupation line. The document stipulates the harmonization of the so called legislation of Abkhazia with that of the Russian Federation, as well as with the standards of the Eurasian Economic Union, creating a precondition for Abkhazia's future membership of the latter group. It is worth noting that Russia also commits itself to pursuing efforts in order to expand the international recognition of Abkhazia's so-called "independence" and facilitate its accession to international organizations, including those created at Russia's initiative. Abkhazia is an integral part of Georgia and is not a subject of international law. Any attempt to sign a treaty with the region is therefore a flagrant violation of international law and constitutes an illegal action devoid of legal consequences. 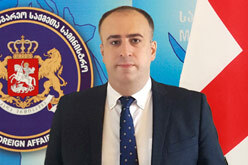 The Georgian Foreign Ministry expresses its deep concern over the Russian Federation's illegal actions. Despite the series of constructive measures which the Georgian government has taken to de-escalate relations with Russia, Moscow continues the provocative policy aimed at undermining Georgia's sovereignty and territorial integrity. In the light of recent developments in the region, the signature of the document is a clear manifestation of both Russia's far-reaching plans and of its intention to hamper the pro-Western policies of sovereign states, including by means of occupation and annexation. Despite the Georgian government's repeated calls, by signing this document Russia has further violated its international commitments, including those undertaken under the 12 August 2008 Ceasefire Agreement. This is of particular concern given the absence of international arrangements in the occupied regions and Russia's refusal to commit itself to the non-use of force. The Georgian government is making use of all the resources at its disposal in order to keep the international community up-to-date with Russia's illegal actions. The Georgian Foreign Ministry condemns the signature of the so-called "treaty" with the Sokhumi occupation regime. The Ministry calls upon the international community to properly assess, both politically and legally, Russia's actions and exercise due pressure on Moscow. The firm and unanimous support of the international community will be of decisive importance as part of efforts to bring an end to Russia's destructive activities.